B. Thomas (Arlington, Texas, United States) on 7 January 2019 in Animal & Insect. A friend's other Cocker Spaniel, Chesney. (Sophie was posted yesterday.) Both dogs are usually VERY active and hard to photograph. Not everyone is interested in the career of the model. This is the skill of at least resting. This little character looks tired, but relaxed. Gorgeous photo. He looks so tired ;-) really a lovely dog ! so do my dog too ! It is looking into your camera ! 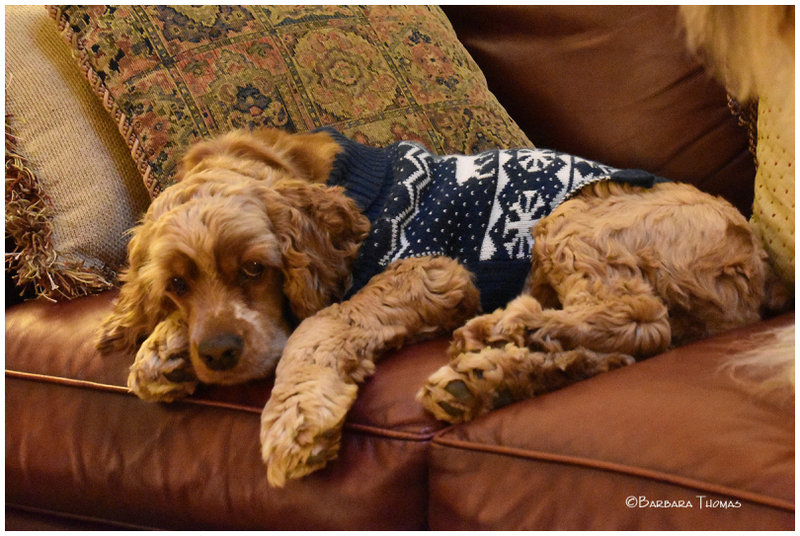 A very relaxed and well dressed Spaniel. A cute spencer he is wearing. you caught a nice image when this Chesney snoozed for a while !!! This is definitely a dog's life!! I love that winter festive vest and his wavy coat of hair! Another beauty! These dogs are very well taken care of and loved. Such a precious face! This is an adorable portrait! So sweet! oh my God, a Christmas sweater for the dog. Did not he get too hot with?